Artist's concept of the Glory spacecraft in orbit. ROME ? A problem with the Glorysatellite's solar arraysystem and continued engineering work to clear the Taurus launcher forflightare delaying the start of a $424 million NASA mission to investigateclimatechange. Managers tentatively reset Glory'slaunch forFeb. 23 to give teams more time to prepare the satellite and Taurus XLrocket,according to a NASA status report released Friday. The Feb. 23 date is pending approvalfrom the Air Forcerange. The satellite was supposed to shipthis month to the launchsite at Vandenberg Air Force Base, Calif. Liftoff was previouslyscheduled forNov. 22. But ground testing uncovered a glitchin a mechanism thatdrives one of Glory's two solar panels, which generate electricity forthespacecraft and its two Earth observation instruments. "It's a solar array drive we had ananomaly with andwe're trying to correct," said Bryan Fafaul, Glory's project manager atthe Goddard Space Flight Center in Maryland. In an interview last week, Fafaul didnot provide any moredetails of the problem or its solution. He did not respond to questionsFriday. Glory is currently in a factory atOrbital Sciences Corp. inDulles, Va.
Orbital is also the mission's launchprovider, and thecompany is wrapping up engineering reviews of the Taurus rocket'spayloadfairing, the culprit of a mishap in the booster's last mission inFebruary2009. The shroud-like fairing did notjettison as planned duringthe 2009 flight, which carried the Orbiting Carbon Observatory, anotherNASAsatellite linked to climate change research. A NASA board of inquiry could notidentify a single sourceof the anomaly, but officials noted four possible issues that couldhave causedthe fairing separation failure. NASA and Orbital are still completingtheir improvements tothe rocket to address the potential causes of the mishap. Glory's launch has been delayed morethan a year since the Taurusmishap in early 2009. Engineers used the extra time toimprove a payload computeron the observatory and conduct more risk-reduction and environmentaltesting onthe spacecraft, according to Fafaul. "More time with the hardware isalways a goodthing," Fafaul said. Fafaul said the Taurusreturn-to-flight reviews are alsodriving Glory's new launch date. "The new launch date provides thenecessary additionaltime required to complete preparations for the rocket and thespacecraft,"NASA said in Friday's status report. Orbital did not comment on the delay. 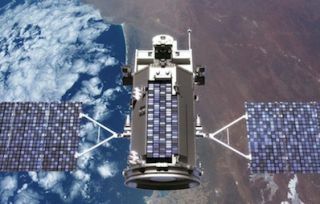 Glory's two instruments will measureEarth's energy budgetand study the link between manmade and natural aersolsand climate. A solar irradiance monitor willquantify the solar energyentering the atmosphere to chart the sun'srolein Earth's climate. The measurement is crucial for scientistsidentifyingother sources of climate change. "The most important thing that wehave driving ourclimate is the sun," Fafaul said. "The first thing you need to knowis did the sun change." An aerosol polarimetry sensor willcollect sunlightreflected off of atmospheric particles to determine their size, shapeandproperties, according to NASA. Once it arrives in orbit, Glory willenter NASA's A-trainformation of Earth observation satellites, flying a few minutes aheadof theAura spacecraft at an altitude of 438 miles.